Text of 1987 History by Barbara Oliver – St. Peter's Church, Henfield with St. Giles' Shermanbury and St. Peter's Woodmancote. Written by Barbara Oliver in 1987, based partly on Henry de Candole’s ‘The Story of Henfield’. Henfield Church, dedicated to St. Peter, stands at the highest point in the village, on a sandy ridge above the River Adur. It was in AD 770 that the Saxon Count Warbold, whose partly-fortified manor house lay near the river’s edge at Stretham, was granted permission by Osmond, the Saxon King, to build a church for his peasants on the hill overlooking the river. He was to assign 15 hides of land “with all things pertaining thereto, that is fields, woods … rivers, springs” for the enterprise, and of this first church, probably a very small wooden building, no trace remains. In 1250 documents allude to a new church, almost certainly on the original site, built of Caen stone, probably brought up the Adur from Shoreham, to the wharves that then existed in the parish. This would have been a small building with no aisles and a short chancel, and from this period only the chancel arch remains and two narrow lancet windows, later removed to the clergy vestry. By the 14th century, building began again, possibly because of a growth in population. The north wall was pierced and the arcade of sturdy pillars and arches built, the corresponding pillars on the south side being added rather later. Lean-to passages to the north and south of the church were fore-runners of the present side aisles. It is always supposed that stone for this stage of building came from the quarry in Stonepit Lane, a mile west of the church. At this time, too, the roof was heightened and the upper windows constructed, and a fine south porch was built, with good timbering and larger than our present porch. In the 15th century a chapel was added to the north of the chancel, dedicated to the ‘Commemoration of Our Blessed Lady’ and the sturdy tower was probably added at the same time. Few alterations or additions appear to have been made to the church in the ensuing centuries, nor did it suffer under the Commonwealth. 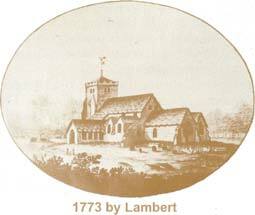 In 1773, William Burrell, of nearby Knepp Castle, himself a well-known antiquary, made a survey of Sussex parishes and left not only a description of Henfield Church but also a drawing of it by an artist called Lambert, who accompanied Burrell on his extensive travels through Sussex. The south porch, at that time, was much longer than it is now. There is a narrow lean-to south aisle with two gabled windows above, and the chancel can be seen in its original form. A hundred years later a great restoration took place when the church was found to be in poor repair and ecclesiastical fashions were changing with a revival of enthusiasm. Henfield Church was fortunate in its architects, who had built the Woodard Schools at Lancing, Hurstpierpoint and Ardingly—a blue plaque on the large white house in Church Street records that Canon Woodard, the founder of these schools, lived there from 1862 to 1891. The re-building and restoration of the church must have caused much heart-burning among the faithful of Henfield. The old galleries were swept away and the ceiling removed to expose the splendid beams. 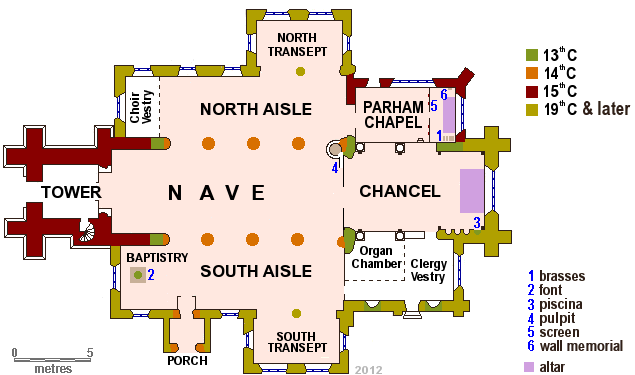 Wide aisles and transepts were thrown out, north and south, and the chancel lengthened and steps inserted. The old closed-in pews were replaced by the present varnished open ones, and the wall- texts were whitewashed over. Since these drastic additions and subtractions in 1871, no major work has been under- taken. In 1941 and 1943 the Horsham slab roof was damaged by near-by bombs and the north side was renewed. The south side was renewed in 1986. Every five years necessary repairs are carried out faithfully under the eye of the Diocesan Architect. So St. Peter’s Church stands where it has always stood for over 1200 years, the very centre of the life of Henfield. From the churchyard, the 14th and 15th century Church with its golden grey local stone and Horsham slab roof, can be seen enclosed in the 19th century additions with their flint-faced walls and tiled roofing. A hundred and four beautifully clipped yews are a feature of the south and west approaches to the church, and there are some fine 18th century gravestones. The vicarage, dating from 1830, lies opposite the west door; and the modern Church House (church hall), replacing a corrugated iron erection, was built in 1967. There are some good black-and-white cottages in Church Lane, and a thatched one north-east of the churchyard has cut-outs of cats and canaries on its outer walls. The eccentric owner, Bob Ward, thus commemorated the alleged murder of his canary by Canon Woodard’s cat, and hoped to remind this worthy gentleman of the fact each time he walked to Church from his house in Church Street. Bob Ward acquired the painted boards, setting out the Creed and the Commandments, in the 1870 refurbishing of the Church, and slept happily for the rest of his life with Creed at his head and the Commandments at his feet. These boards have been retrieved and are now in the choir vestry. Entering the Church under the 15th century buttressed tower, some interesting records of the Church over the centuries can be seen on the walls of the porch. The ancient low door in the south wall leads up to the ringing chamber, the clock and bell chamber. A plaque records that the clock was paid for by public subscription in honour of Queen Victoria’s diamond jubilee. Twice a week this clock was wound with 243 turns of a very heavy handle but now electric winding has been installed. There is a magnificent ring of eight bells mostly dating from the 18th century when a tenor bell was added to the existing five especially for the ringing of the knell. The bells were re-cast in 1913 and are considered one of the best rings in Sussex. Entering the nave, visitors are struck by the magnificent chancel arch, the solidity of the pillars and arcading in the nave, and the splendid mediaeval timbered roof. The memorials on the left-hand wall are to the Cheale family of Shiprods, whose 18th century generosity to the Church included a fine bell and several pieces of church plate. In the north aisle, all is the work of the 1871 restoration architects. There is a window dedicated in 1903 to the memory of Dr Caudle after whom a narrow, shop-lined passage off the High Street is named. The north transept [was] turned into a church library, and here [was] a case of old musical instruments used in pre-organ days by the players in a gallery built over the west porch [however sadly, like the neighbouring parish of Shermanbury, both cases of instruments were stolen]. Here, too, are the church chests. One is Jacobean and the other rough-hewn, banded with iron and with three locks, must have been in use since the earliest stone church was built. From here can be seen the slots in the chancel arch where once the rood stood upon its screen, and above it, filling in the arch, would have been a wooden board, painted, probably, with a scene of the Last Judgment. The chapel, dedicated to the ‘Commemoration of our Blessed Lady’, is entered through a 15th century carved wood screen, and is a fine example of perpendicular work. The east window is of the same date though the glass is modern. It is known as the Parham Chapel because of its connection with the Bysshopp family, once the owners of Parham House, near Pulborough. A memorial tablet on the north wall commemorates the wealthy Henry Bysshopp of Parsonage. A small memorial brass from the tomb of his grandfather Thomas Bysshopp, who moved to Parham House, lies at its foot, depicting a dignified man in fur-trimmed robe and records his death in 1559. The chapel was untouched by the 19th century ‘improvers’. A window to the memory of William Borrer, a famous botanist, is in the north wall. On the sill of the north window is a Book of Remembrance of those whose ashes are interred in Henfield. A page is turned every day. (There exists also an interesting model of the Church before restoration in the 19th century.) Engraved glass windows enclose the upper halves of the arches surrounding the chapel. These depict the sower and the reaper rejoicing together (John 4.36) and the rejection of evil (represented by the serpent) by the people of Henfield (represented by the hen). The whole emphasises the agricultural character of Henfield. These were installed in 1969. The chancel of Henfield Church is all 19th century work, with the exception of the 14th century piscina, moved here in 1871. The wooden screens on the north side of the choir replaced an iron gallery in which the young ladies from Miss Martin’s very select school at Moustows Manor, in the High Street, were discreetly penned during services. The kneeler at the altar-rail was stitched by parishioners in 1957 to a design representing the Creation by local artists Hardie and Susan Williamson. The kneelers in the Church were designed and made by the St Peter’s Guild of Tapisseurs from 1983 to 1988 and depict the flora and fauna of the parish. There are nearly 300 different designs. In the south transept is a carved screen, created by a local boys’ class as a thanks- giving in 1887 for the safe delivery of the vicar and his wife from ship-wreck. Their cross-channel steamer appears to have gone aground just outside Calais harbour. The font in the south-west corner of the church is sturdily plain and of a familiar 15th century design. The window glass in Henfield Church is mainly 20th century work by quite well-known artists including C E Kempe [look out for the ‘wheatsheaf’ signature] and Geoffrey Webb [look out for a tower on a wheatsheaf’ signature]. Returning to the west door, there are memorials high up on the south wall, one of which records the short life and good works of the Rev Charles Dunlop. Above the list of Henfield men killed in the late wars. [St. Peter’s also has one of the] Union Jacks which draped the coffin of the Unknown Warrior on part of its 1919 journey from France to Westminster Abbey [and this flag is featured as part of the Remembrance Sunday service each year in church]. This village has never laid claim to anyone of historical or national fame, but through the ages there have been many characters of interest, many benefactors and a few engagingly eccentric folk making up the congregations over more than 700 years. The history of the Bysshopp family goes back to Tudor times, when Thomas Bysshopp from the north, took over the tenancy and tithes of Henfield from the Bishop of Chichester, whose legal adviser he had become. Full of Tudor enterprise, Thomas Bysshopp added many estates and manors to his Henfield property and built Parsonage House (to the north of the church) for himself. He died in 1559 a very rich man, able to lend money to the Duke of Norfolk himself, and leaving £20 “for maintaining the Catholic faith in Henfield”. His son, another Thomas, rose to be Secretary of State under Walsingham, and he, too, did not swerve from the Old Faith although, under Queen Elizabeth, this cannot have been easy for an ambitious man. He was created one of the first baronets by James I and sought a grander background than Henfield’s Parsonage House. He bought the Elizabethan mansion of Parham, near Pulborough, and although, unlike his father, he was not buried in Henfield’s Lady Chapel, the connection with Parham is kept in the Chapel’s name. A younger son of Sir Thomas, Henry Bysshopp, lived at Parsonage House until his death at the great age of 86, after an eventful life. In the Civil War he supported the King’s cause and had to hide in a cupboard to evade capture. A portrait of him with his favourite terrier who shared this adventure with admirable discipline, hangs in Parham House. Henry decided it was safer to turn Parliamentarian and spent a period in Virginia cultivating his estates. On his return, the restored monarch seems to have forgiven Henry’s temporary lapse and he was appointed Postmaster General (an obviously lucrative post for which he had to pay an annual rental of £20,000) and he is credited with introducing the first datemark on letters “so that no letter-carryer may dare detayne a letter from post to post, which before was usual”. Henry Bysshopp had a sister Elizabeth who married Sir John Gresham and went to live in Surrey. But she did not forget her childhood home and assigned the rents of fields she owned to the south of Henfield for a sermon to be preached annually in the church on All Saints Day, and for “cloth to be cut into parcels and to be given to certain poor people to make them clothing, but not to sell the same”. The Dame Gresham’s Charity still exists; the sermon is preached, the preacher paid 10s [50p] as by her wish, and the pieces of cloth transformed into welcome vouchers. Of the vicars, one of the earliest was 12th century Thomas Love or Lowe who held the Prebendal Stall of Henfield, supported by its tithes. Unlike many of his prebendal colleagues who lived fatly on the tithes of numerous parishes without concern for the parishioners, Thomas Love assigned “the smaller tithes calves, lambs, wool, honey…” to endow a vicar to attend to Henfield’s spiritual needs. This would enable the man to avoid “the opprobrious necessity of begging” which must then have been an all too frequent situation. In 1520 the prebendal estate of Henfield passed into the hands of the Bishop of Chichester, who still holds the patronage of the living. During the next 200 years, Henfield had many vicars, good and bad, of the Old Religion and the New, Puritan and Royalist, whole-time and very much half-time. But in 1704 the Rev Thomas Milles was instituted and stayed in Henfield for 57 hardworking and caring years. At last the people had regular services, “Divine Service and sermon every Lord’s day. . . Catechising in the afternoon and Communion administered at Christmas and Easter, twice in Lent and every other month”. Mr Milles kept immaculate church records, and the authorities declared that both church and vicarage were “very decent”. His concern for his parishioners extended to the vagrants shuttled from parish to parish by the Poor Law, and he was largely responsible for the building of the workhouse, now a row of cottages in Nep Town Road. The memory of Mr Milles remained green through the ensuing years of pastoral inadequacy until the arrival of the Rev Charles Dunlop in 1837 ushered in a period of great revival. He, and later his son, also Vicar of Henfield, were typical of the best of Victorian clergy in a period of renewal. Under them the church was restored and modernised and the schools developed, to include girls and infants. They were fortunate to be able to work with the Borrer family who lived at Barrow Hill, a Georgian house pulled down in 1946 after housing troops during the war. William Borrer was a famous botanist, so famous that when Linnaeus addressed a letter to “William Borrer, England” it arrived with no difficulty in Henfield. He made a magnificent garden at Barrow Hill, much visited for its rare plants. His generosity to the village in which he lived was exemplary. He gave much thought and money to the restoration of the church and presented a pair of boots annually to each child in the Church Schools, with 4s in addition for repairs. It is curious that the boots were shaped identically for both feet. His son, a keen ornithologist, once counted 14 golden orioles on a bush on Henfield Common. To this list of worshippers can be added Canon Nathaniel Woodard, founder of the Woodard Schools, whose large white house lies to the north of the church; and a host of unknown and unsung people for whom the church is, and has been, the centre of their lives.